*Note: at any point in the process you may use the "back" button at the bottom of the screen (not your browser back button) to easily modify your selections. 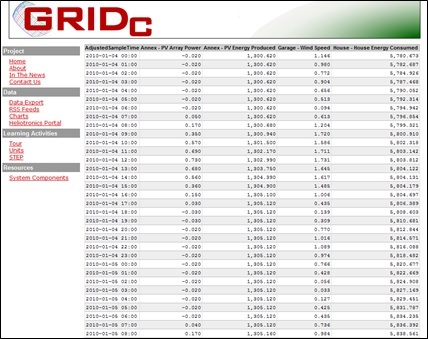 GRIDc Home - Go to www.gridc.net and click on "Data Exporter". This is the second item under "Resources" on the left side on the screen. 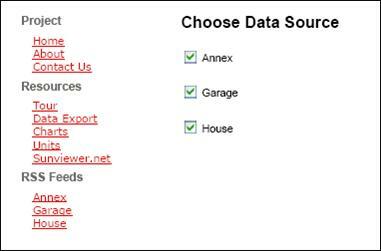 Choose Data Source - Choose the appropriate data source by clicking the boxes that apply, you may choose more than one. For example, if you are looking for the amount of energy consumed by the Solar House, you must click the box next to "House". If you are looking for the amount of energy produced by the PV panels "Garage". Once you have selected the appropriate options, click "Next". Choose Averaging Period - You can choose the averaging period by clicking the box next to the suitable option; you may only choose one. InExample 4, you are asked about the household's weekly use of energy; thus, you will click the box next to "Day". Now click "Next". Question: Why do I select daily data if the questions is asking me about consumption over a week? Answer: The data you obtain from energy meters are cumulative; therefore, in order to obtain the amount of energy consumed or produced in a given week, you will have to subtract the energy readings of the last day of the previous week from the final day of the current week. Choosing Fields - This page gives you a list of data available for each source (i.e. House, Garage, Annex). You can select the fields for which you would like to see data by clicking in the box next to that field, you may choose more than one. For example, if you would like to see daily energy production for the PV panels on the Annex, you can click more than one. When you have selected your fields, hit "Next". Choose Date Range - Choose the date and time range you are interested in. If you click inside the "From" box, a calendar will pop up, which will allow you to easily choose the dates you are interested in. Otherwise, you can type in the dates manually. Once you are done, click "Next". Choose Data Format - You may observe the data in CSV or HTML format by clicking in the circle next to your choice, followed by "Finished". CSV presents the data in an Excel worksheet, which allows you to manipulate data in a spreadsheet. Analyze Data - Now you are able to read your data in either HTML format or CSV in an Excel Program. Note how you can have data from multiple areas side by side for comparison. For information on how to build a graph to visually represent the data gained, visit the Graphing Tutorial.